With the continuing decline of international first class and the stagnation of innovation in the premium economy market, “business class” is having to cover an increasingly wide range of onboard seating products. First class seats are looking as increasingly luxurious as they are increasingly stratospheric in price. Premium economy seats are essentially the same now as they were when introduced in 1993. 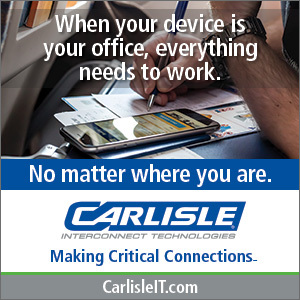 But business class has evolved in ways that very few people could have foreseen in the last days of the 1970s when business class seats were introduced. 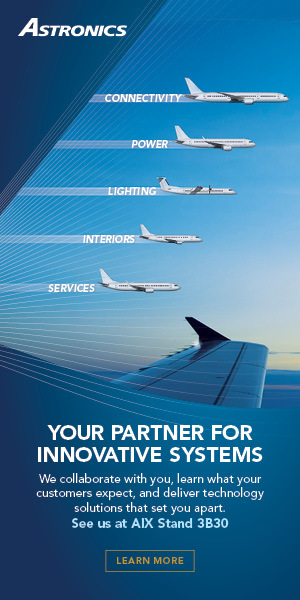 With the demise in the last year of the old winched convertible British Airways seats that expanded and contracted to provide extra width, Eurobusiness has become simpler to describe: economy seats with the middle seat free, sometimes blocked with a special on-seat table. It’s notably similar to the first generations of business class seats in the 1970s — economy with a few more perks. 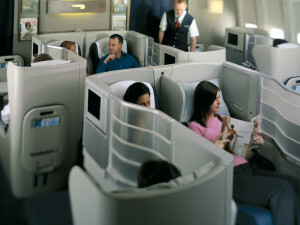 Shorthaul business class and US domestic first still see a significant number of recliners. 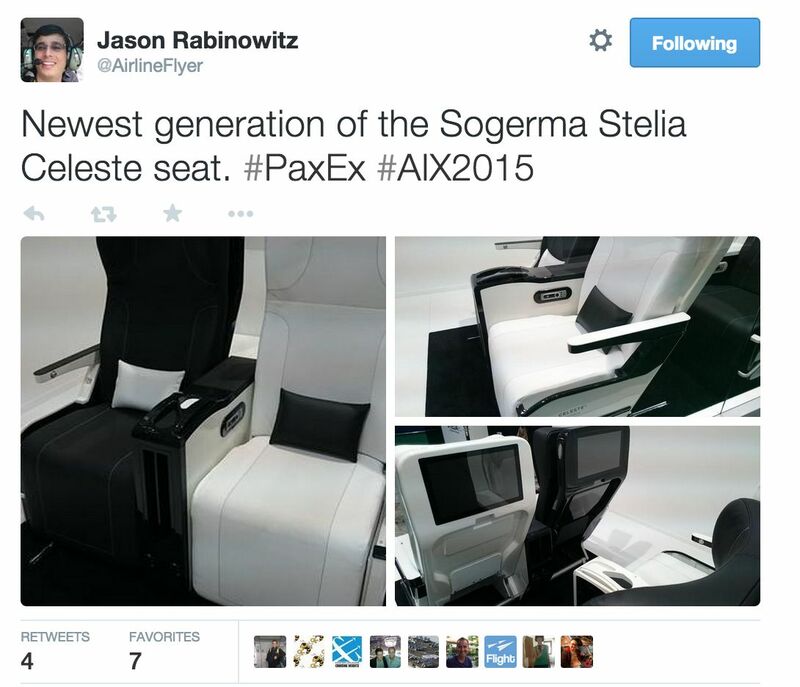 The back reclines, a legrest swings up — or, in the case of Airbus seatmaker Stelia’s Celeste, the entire seat slides down in a manner reminiscent of Le Corbusier’s iconic 1928 chaise longue à reglage continu. Some innovations are on the horizon, but these are mainly around a more efficient use of space and extra bells, whistles and screens rather than a significantly different product to the first class seats of the past. 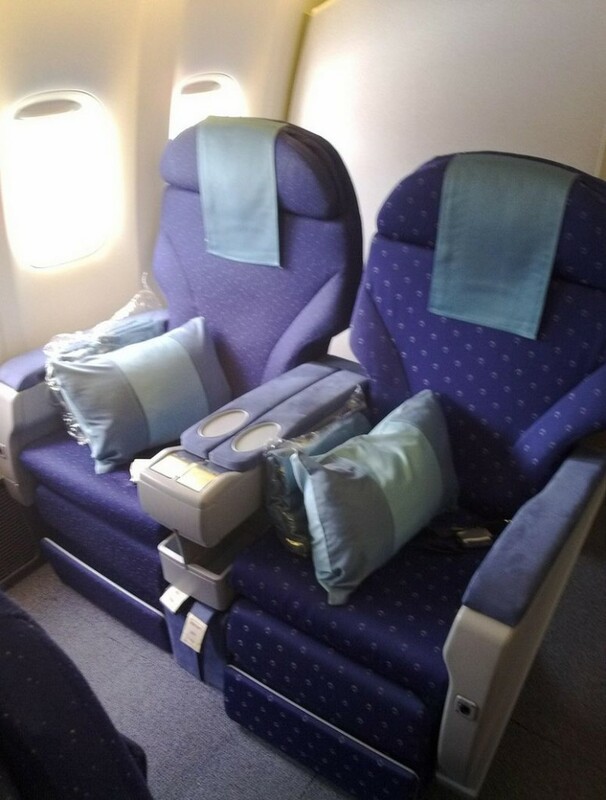 The old “sleeper seat” style of international business class, cradles are different to recliners because the seat goes further back, the legrest swings further up, and often the seat pan will tilt to provide more comfort when sleeping. 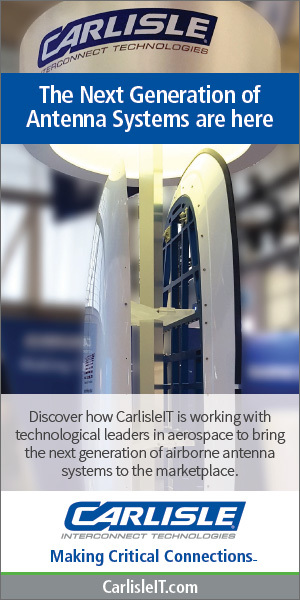 Cradles predate the angled lie-flat era of the late 1990s, and are seen on fewer and fewer aircraft two decades later. Pioneered by Virgin Atlantic with the J2000 seat in 1999, angled lie-flat seats recline to a flat (or mostly flat) surface, but are not parallel to the floor of the cabin, usually around 150-170°. The propensity for passengers to slide down towards the ground while their clothing remained where it started led to the “wedgie-bed” nickname for these seats. Most airlines with angled lie-flat products are now renovating their fleets or cabins to a fully flat bed option, with Emirates’ Boeing 777 angled seats one of the few exceptions. There is perhaps most diversity at the fully flat bed end of the spectrum, mainly around the age, width, layout and cushioning of these seats. 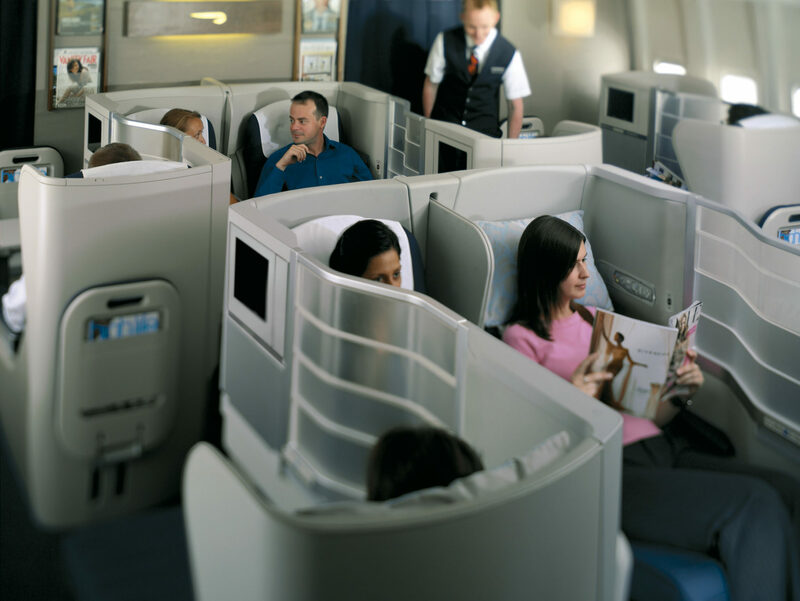 Introduced by British Airways in 2000, earlier model seats without an ottoman often come in for criticism for the “leg droop” problem, where the foot end of the reclined seat is unsupported and can be less than fully flat. Newer versions also tend to avoid a middle seat of three, and come with extra cushioning (or a soft product mattress pad) to reduce the impact of ridges and gaps in the seat fabric. Narrowbody versions of these seats tend to be in a 2-2 configuration, with widebodies ranging from 2-2-2 on a 767 fuselage to 2-4-2 on a 777 or larger. The principal complaint about these seats is the “midnight clamber” where a middle or window passenger must vault gracefully (or otherwise) over their aisle neighbour. To more efficiently use space, the footwells of some fully flat beds overlap to the side of the pairs of passengers in front. The “H” pattern, where columns of seats angle away from the aisle (or one of the aisles in the case of a widebody), with the footwells under the shoulder of the next row, is the most common here, with B/E’s Diamond product the most popular with airlines. 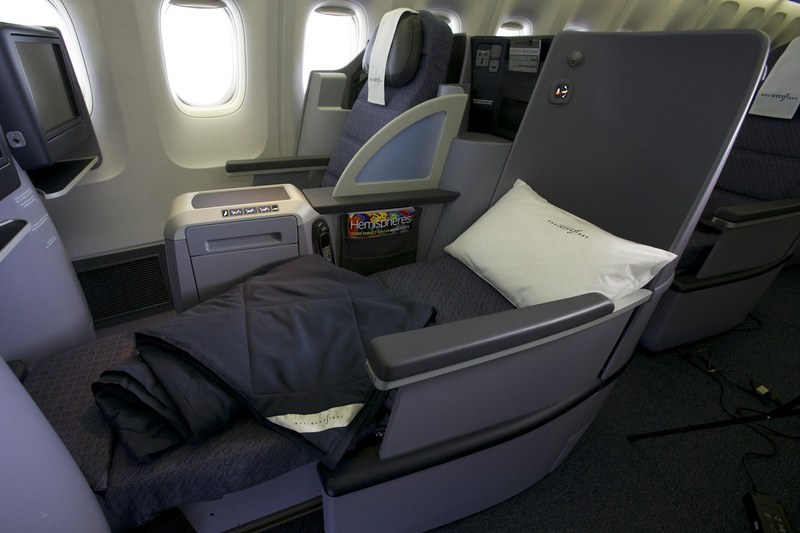 Lufthansa, though, introduced its current generation of business class on the 747-8I in an “A” pattern throughout, where passengers’ feet were angled towards each other in what became called “footsie class”. 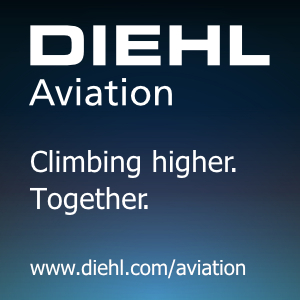 In its recent refitting of its Boeing 747-400 fleet, the German carrier has now moved away from the A pattern towards the H pattern, except in the centre column of seats on the main deck. The V pattern, by contrast, has neighbouring passengers facing away from each other, with their heads closer together (and away from the aisle) and feet pointing away from each other when in bed mode. 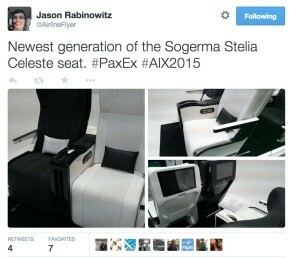 Airbus’ Stelia (then Sogerma) seat subsidiary introduced the Equinox 3D seat at AIX in 2014, and it launched with Philippine Airlines shortly afterwards. These are a denser version of the V pattern, with one seat rising to flat and another sinking to flat in order that the feet of the higher bed are above the feet of the lower bed. Stelia is clear that these seats are intended for the market segment at the lower end of the premium scale, often replacing angled lie-flat seats. There’s a remarkable amount of difference in space and comfort among the various manufacturers in the staggered category, with Thompson’s Vantage product, Stelia’s Solstys and B/E Aerospace’s Apex seats all offering different amounts of room. Vantage even comes in several widths depending on how dense a cabin an airline prefers, with fewer seats across meaning a more spacious seat area — and direct aisle access for every passenger. 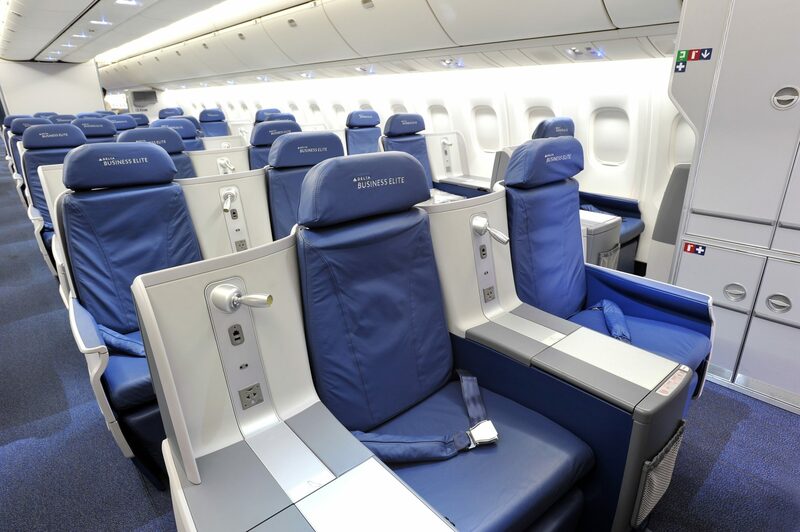 Delta’s Boeing 767 aircraft, for example, offer the Thompson Vantage product in an alternating 1-2-1 layout. Finnair’s slightly wider A330s offer a 1-2-1/2-2-1 pattern, which gives alternating rows eithera “throne” solo seat or a pair by the window. 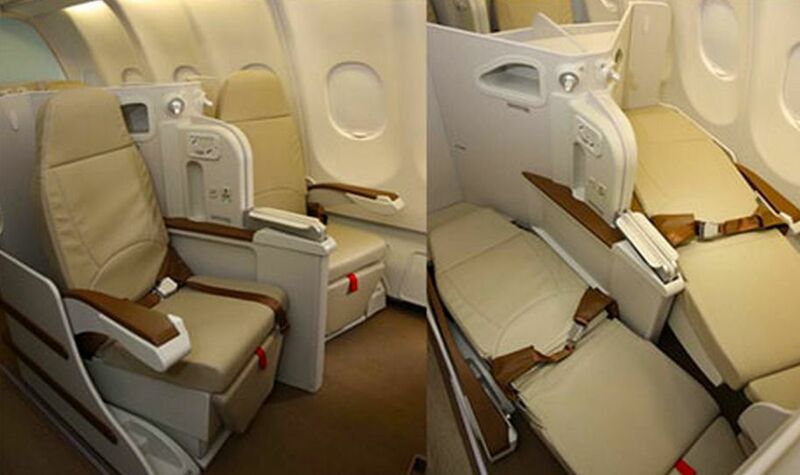 Qantas’ newly refurbished A330s, meanwhile, are all 1-2-1 with the Vantage XL-branded seat. Some products also offer either a “honeymoon” pair of centre seats or a “divorced” layout where every neighbouring centre pair is separated by a side table. 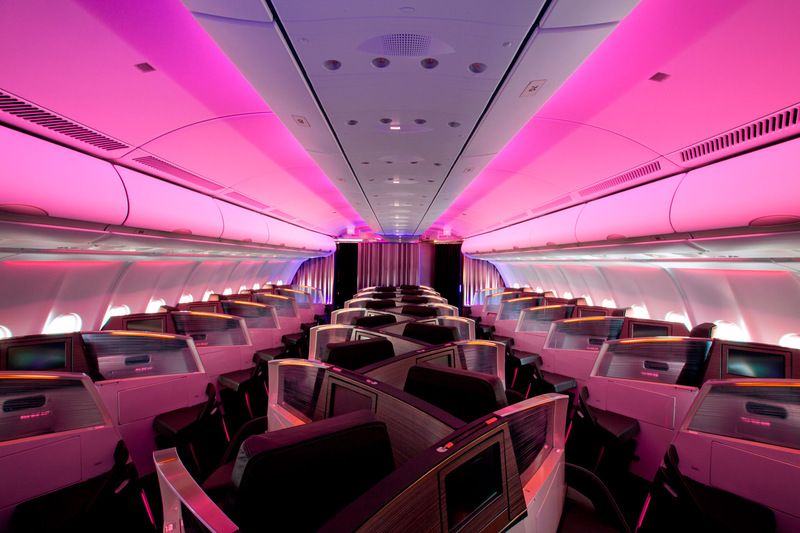 Virgin Atlantic introduced both herringbone seating and direct aisle access to the business class market in 2003 with the Upper Class Suite. The direct aisle access and bed length benefits are clear, but some passengers dislike turning their heads to look out the window. 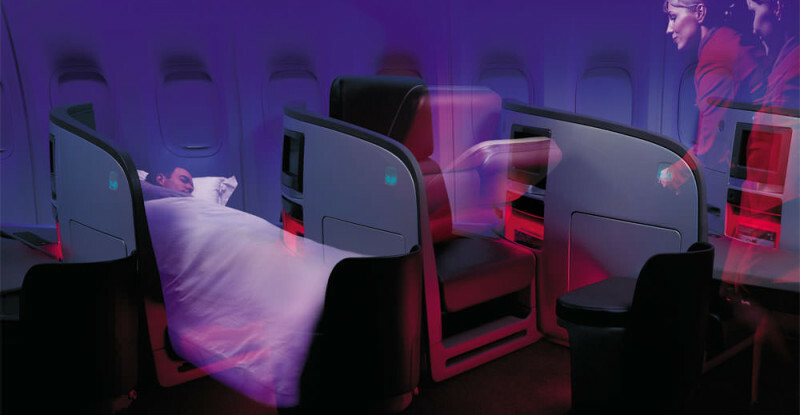 Virgin’s version of this seat (also licensed by Air New Zealand for its Business Premier product) also flips over to become a bed, and is without an adjustable legrest, limiting the positions available in recline mode. Subsequent inward-facing herringbone seats appeared and have been eclipsed by newer products, most notably by Zodiac’s Cirrus seat, which faces towards the window or the centreline of the aircraft. Virgin Atlantic introduced a new generation of inward-facing herringbone, which featured a staggered central column of seats, on its A330 fleet. 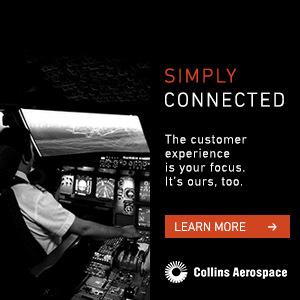 Known initially as “reverse herringbone” seating, Sicma (now Zodiac) launched its Cirrus seat and this entire market category in 2009 with an unlikely partner in US Airways. 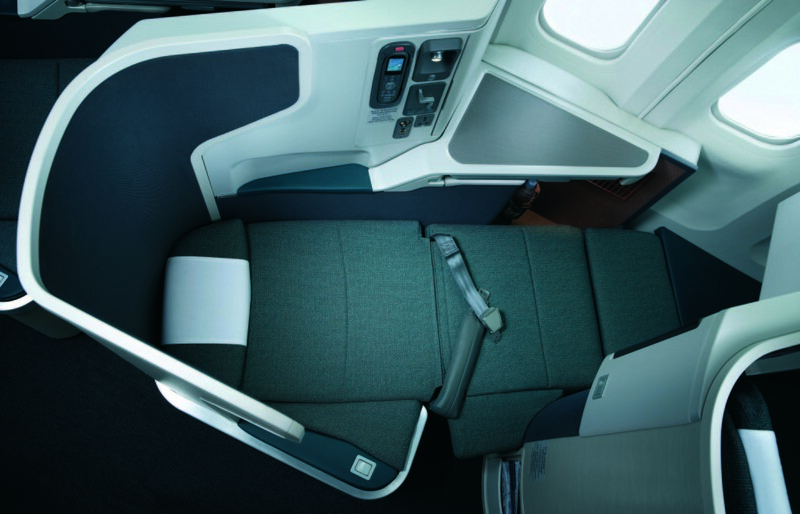 Cathay Pacific’s 2010 update included a number of ergonomic improvements, and subsequent iterations have built on this platform to make it a favourite with both airlines and passengers. As a result, numerous outward-facing herringbone seats are now being offered by many different seatmakers. 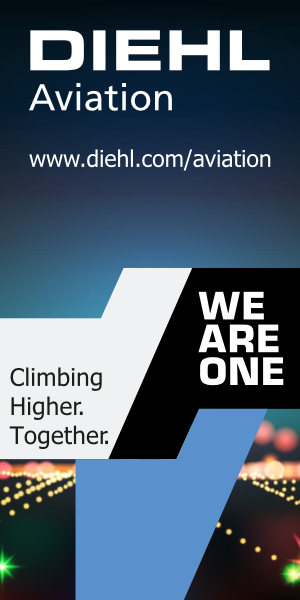 In addition to the basic options, a number of airlines have chosen or developed their own seating for differentiation, efficiency and brand positioning reasons. Mixed herringbone variants: A notable update at this year’s Aircraft Interiors Expo in Hamburg was the introduction of options from several seatmakers to combine inward and outward facing herringbone seats, so the window seats faced towards the window but the centre seats faced towards the aisle, for example. Flipover fully flat bed variants: These bring some benefits, and Virgin Atlantic’s original herringbone set the standard here, with Singapore Airlines’ longhaul seats (manufactured by disgraced Japanese seatmaker Koito of falsified safety testing infamy) the other notable example. The benefits: putting a mattress with a different foam structure on the back makes for an excellent night’s sleep. 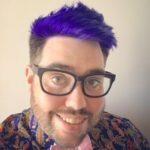 The drawback: the flipover mechanism means that reclining to sleep isn’t a possibility, and there are fewer La-Z-Boy-style relaxation positions on a long day flight. Yin-yang and forwards-backwards variants: British Airways, the pioneers of the fully flat bed, have a dense forwards-backwards fully flat bed configuration that cleverly takes account of the fact that people are broader at the shoulders than at the feet. Seats are tapered to give extra room where it counts. Without that tapering, you get something like United’s pre-merger UA longhaul aircraft, which have an infamously narrow fully flat bed — eight across in the 777 cross-section, just one fewer than economy — arranged in rows that alternately face forwards and backwards. 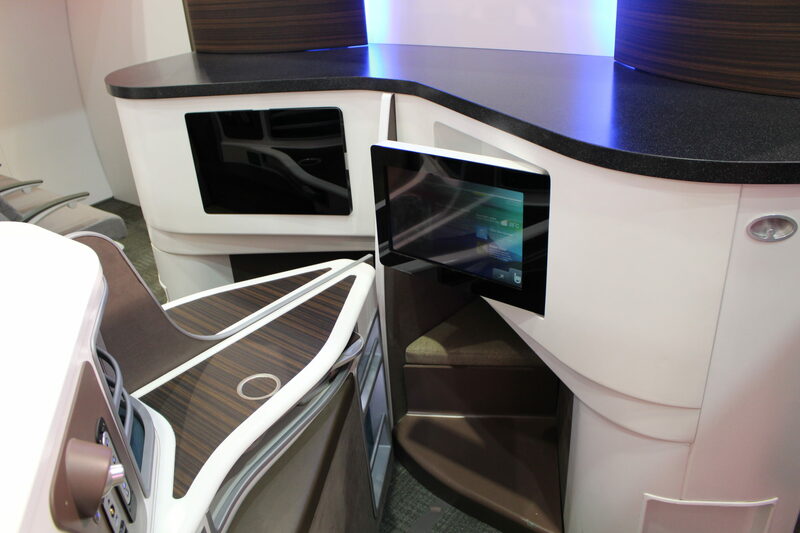 More recently, American and Etihad have released custom fully flat beds with direct aisle access in a yin-yang layout. Gazing into the #PaxEx telescope, the superbusiness seat is swiftly approaching from the horizon. 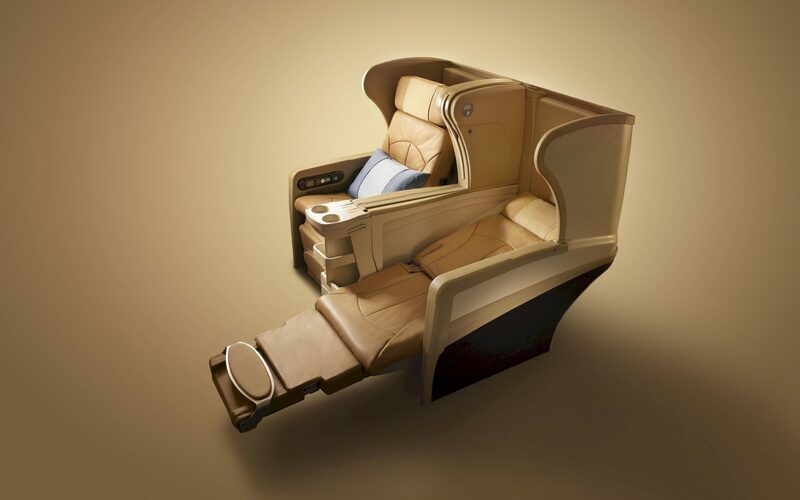 Qatar Airways has been bragging that its next business seat will eclipse first class. One taste of how that might look is a new concept on the Recaro stand at AIX this year, which is essentially an extra-wide, half yin-yang product that adds another evolutionary step to business class. 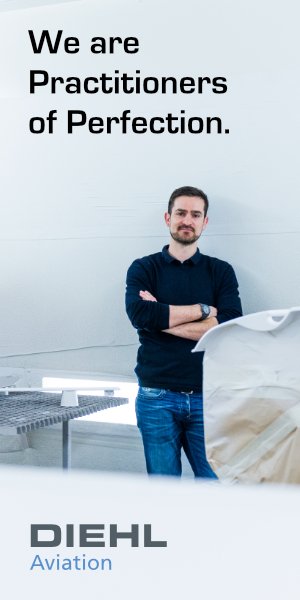 Given the increasing push to increase speed to market and the trend towards custom business class products, will this — or something else — be the Superbusiness class of the future?